Does your eCommerce platform offer limited growth, scalability and flexibility? Is your store’s success limited by the functions of your eCommerce platform? If you answered yes to these questions, you are not running the Magento platform. The Magento eCommerce solution puts an end to difficult navigation throughout your eCommerce store, shopping carts that are difficult to use, lack of order tracking or the ability to market your eCommerce store through one administration panel. 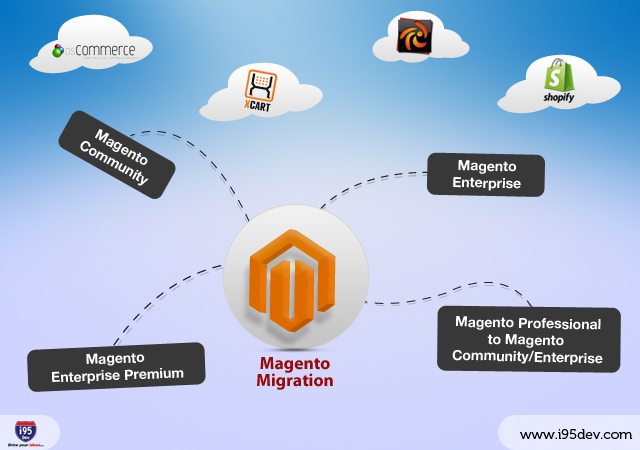 Migrating your store to Magento is a seamless way to increase the efficiency of your eCommerce store immensely. At i95Dev, we offer Magento migration services that will not disrupt your current operations and provide you with a successful eCommerce platform. The transition from your current eCommerce platform to Magento is seamless when you use the services of i95Dev. We make the transition simple so your operations and sales are not interrupted. Check the status of your hosting platform to ensure compatibility with Magento. Copy the design of your website into Magento unless you desire an intermediate design our professional Magento designers can assist you with. Copy your current database over to Magento. This includes all products, images, customer information, orders, taxes, currencies and design settings. Your customers will not notice anything different and will be able to log into their account as usual. Copy your payment and shipping methods, as well as any additional features you have on your current site. Launch your new and improved Magento website. If you are ready to utilize the Magento migration services i95Dev has to offer, please give us a call at 301.760.7499 or email us today for your free, no-obligation quote to see how we can help your store reach new levels.